It's not news to anyone that winter can be hard on your hair. During the colder months, the frosty temperatures outdoors combined with dry warmth inside from fires and radiators can leave your locks in a bit of a state, with breakages and split ends being common. However, help seems to be at hand as every year, beauty bloggers and YouTubers everywhere share their ultimate haircare hacks for the winter season. But do these hacks REALLY work? After the success of my beauty fads busted post, today I've put some popular tips and tricks to the test to see which I'd really recommend. I recently found out that the reason why so many of us (myself included) are plagued with static hair in the winter is actually to do with a lack of moisture in the air! Who knew? Anyway, there are YouTube videos aplenty advising us on how to combat this winter static, and I found one packed with tips from Tressmerize Hair. 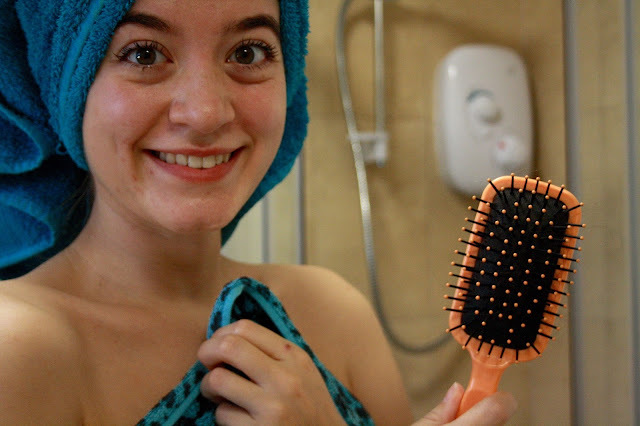 Emina, the face of the channel, recommended placing a dryer sheet over your regular hairbrush to keep your hair static free, or using the metal part of a clothes hanger to absorb the static. When testing this out, I was amazed by how well the dryer sheet did the job, but the metal clothes hanger trick didn't work that well for me - perhaps my hair is just too thick! Another tip that I found on Wikihow was so simple that I cannot believe I hadn't thought of it sooner. In their article all about avoiding hat hair, they recommended parting hair the opposite way to normal before you put your hat on. When you take off your hat, re-part your hair to its usual position and it won't have gone flat under your hat! Genius! I gave this a go and was so impressed with it, definitely a hack I'll be using in future. 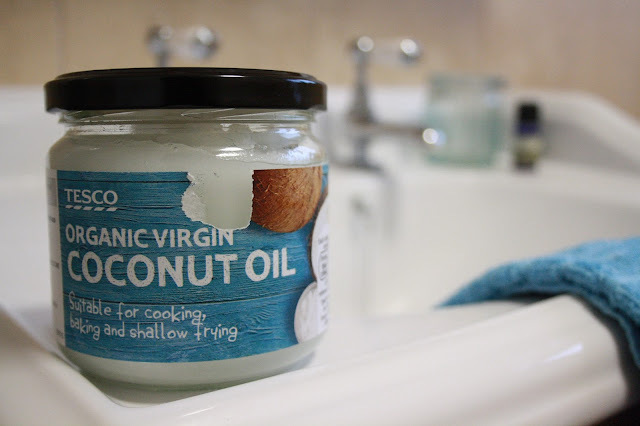 It wouldn't be a haircare post without a mention of this wonder ingredient - coconut oil! Countless bloggers recommend using it for deep hair conditioning, promising ultimate moisture. It is also thought to stimulate hair growth, work as the perfect detangling product, battle dandruff, moisturise your scalp and so much more. I massaged melted coconut oil into wet hair before wrapping it up in a towel and leaving it on for around 30 minutes. My online research found a lot of conflicting information about whether you should put coconut oil onto your scalp (some sources recommended this, others swore against it), so I played it safe and kept it away from my roots as I do experience oily hair and didn't want to make it worse. After the oil had sunk in to my hair, I hopped back in the shower and washed my hair with shampoo. My hair certainly was smooth and silky after each treatment and I found this a luxurious and relaxing addition to my pamper routine which I wouldn't hesitate to continue! Now, I don't know about you, but I LOVE a warm shower or bath on a cold day, nothing warms your cockles more! However, I recently read an article on the Hair Care Manual site which advised that washing your hair in hot water can actually be damaging. Eek. Although it can help with cleaning your hair, the article states that washing your hair in hot water can also weaken the roots and cause breakages. Meanwhile, washing with cold water can make it appear shinier, reduce frizz and promote blood circulation and hair growth. In the interests of *authentic research* (lol), I have blasted myself and my hair with cold water before jumping out of the shower but despite all of the apparent benefits, this hair hack gets a resounding no from me - I value my hot showers just too much! Once you've jumped out of your freezing cold shower, it's time to dry those locks. But did you know that drying with a standard towel can absorb too much moisture from your hair and damage the cuticles, causing unwanted frizz? That's why many people recommend drying your hair in a cotton tshirt, using a technique called Plopping. No, I haven't made that up. You start by detangling your wet hair, applying any necessary products, wrapping everything up in a cotton tshirt and leaving it to dry. As my hair often goes frizzy at the ends, I thought that this would be worth a try! It took quite a few goes to get the tshirt positioned perfectly on my head, and getting it to stay there was a bit of a nightmare. The tshirt also soaks through very quickly (well, it did for my thick hair) and it wasn't the most comfortable thing to wear. My hair also just seemed to take an age to try in the tshirt, so I ended up having to use the hairdryer to finish the job on a few occasions because I needed to go out. Plopping seems to work amazingly for naturally curly girls, but it's doesn't seem right for me. So, there we have it - three myths to recommend and three which have been busted! If this post was a bit TLDR for you, the overall mythbusting verdict is summarised below. Don't say I'm not good to you. 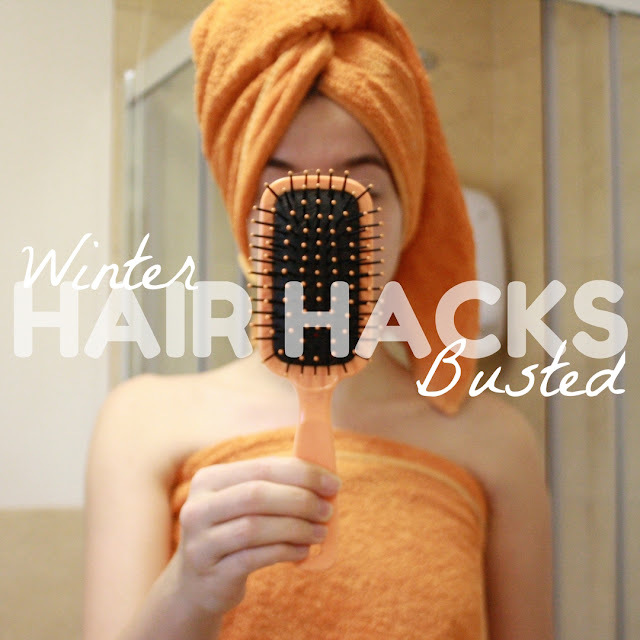 Do you have any winter hair hacks that you swear by? Let me know in the comments below so that I can test them for myself!